Split is a village located on the border between Dementia and Mania (quest-related). The name of the settlement reflects its makeup; it is a settlement that is "split". There is a Manic and a Demented version of each person, each wearing the appropriate bright or dark clothing based on their alignment. This supposedly happened when a mage cast a spell on the town to test the theory that each person has a manic and demented side within each of them. 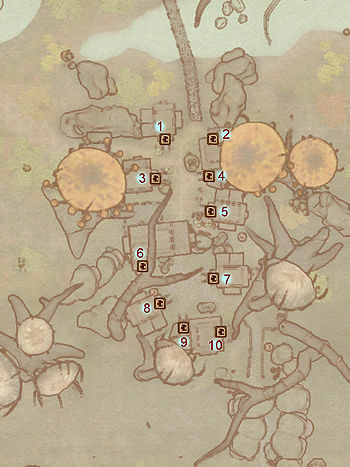 This spot is located at the top of a mountain just south of Fetid Grove, and is the second largest settlement (after New Sheoth) in the Shivering Isles. From all across the Isles, you may hear rumors about this peculiar town, such as: "There are two of everything in Split, even the residents." 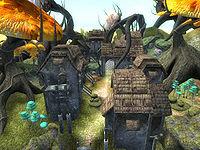 This Shivering Isles-related article is a stub. You can help by expanding it. This page was last modified on 27 June 2017, at 22:06.